This marks the groundbreaking of the #RedditResume project. Join us! Hello and Welcome to #RedditResume! The is the first edition of #RedditResume, which will become an ongoing project. So what is #RedditResume? First, a little back story. It’s a place where people can post their resumes to get critiqued, make edits, and increase their chances at getting a job. I really enjoy reading the resumes subreddit (https://www.reddit.com/r/resumes). It’s a place where people can post their resumes to get critiqued, make edits, and increase their chances at getting a job. It sports over 13,000 subscribers, and has a surprisingly active community. Job seekers are constantly posting resumes to be critiqued — but it’s never too many to prevent anyone from reaching the front page to get advice, and never too little so that the community becomes boring and stagnant. Simply put, the community is great. People put a lot of time and effort into responding to requests for resume critiques — and they do it for free! It’s an efficient system, and I’m sure it’s helped a significant number of people get more interviews, and even jobs. My goal with #RedditResume is to drive even more interest towards the r/resumes subreddit, and create a place where real professional advice is given freely and consistently. Even now, the community is fairly healthy, but I think it could become a robust space where resume writing professionals and career advisors can showcase their knowledge and skills, engage in collaborative debate, and help people find jobs from start to finish. If you don’t have one, create a reddit account. Keep track of the people you’re helping. Are they getting interviews? Did they actually get the job? I think it could end up being an interesting experiment that could provide a lot of benefit to folks who need it. 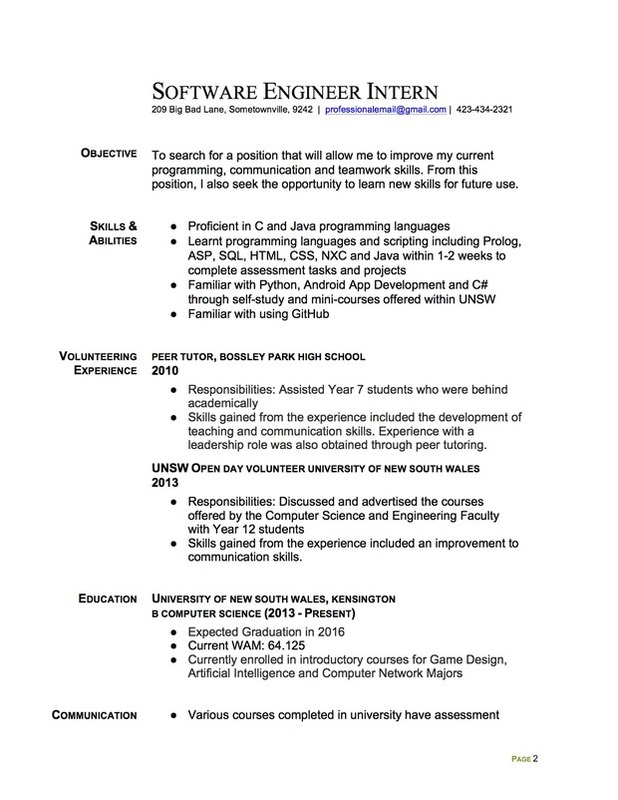 Today, I critiqued a resume by a college student studying computer science, hoping to land a software engineering internship. I asked for his permission to reprint his resume here, sans contact details. I’ve also reposted the tips I gave him on Reddit. Do you agree or disagree with my tips? Please join the thread and make your own comment! Your resume looks decent, but some making just a few changes would make it look more professional and increase your chances of getting interviewed. Firstly, change the title of your “Objective” section to “Professional Profile”, “Career Summary”, or “Qualifications Summary”. It doesn’t matter which one. Objectives are viewed as outdated. The content of that introduction section will also need to change. What you’ve written — “To search for a position that will allow me to improve my current programming” won’t inspire anyone to interview or hire you. After all, everyone applying to those positions wants that. So how can you stand out? Tell the company why you would make a good fit for the job opening you’re applying for. It seems like you’ve got a lot of relevant skills to offer as a software engineer. How many positions are you applying for? 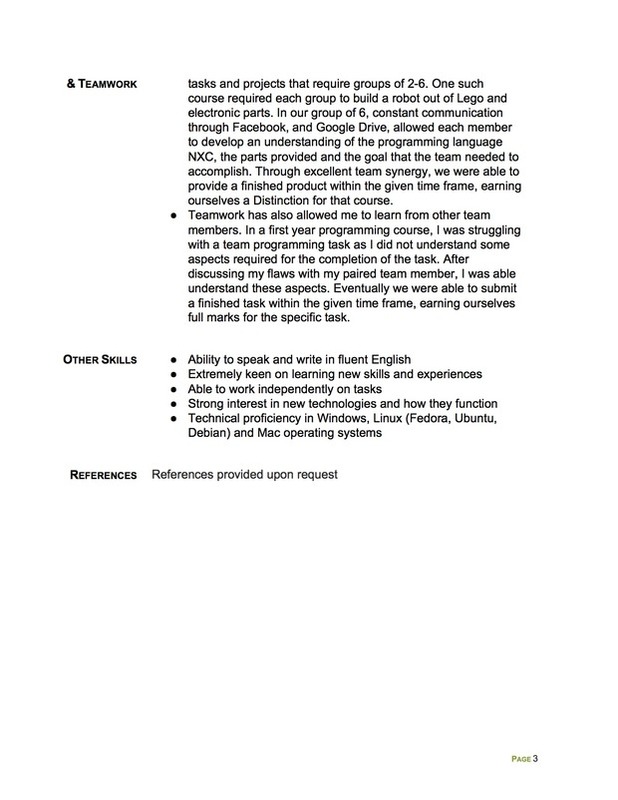 Do these positions emphasize having familiarity with the same programming languages and scripting, or different ones? Target your Professional Profile to reflect how you’ll fill the requirements needed to succeed and excel at the job. Don’t talk about the benefits that you’ll get by being hired. Click here for more tips on writing a winning Professional Profile. Your education section looks great otherwise. Your bullet points are phrased a bit awkwardly. Ideally you’d list more than one responsibility (you have it labeled “responsibilities”). Maybe be more specific about how you assisted Year 7 students. Begin your bullet points with action verbs. (Try this Longest Action Verb List in the Universe) “Tutored struggling Year 7 students in algebra and reading comprehension” would be better and more specific, for example. Instead of listing your skills gained, try to develop bullet points that convey how your communication skills improved, and how you demonstrated leadership skills. Writing a resume without much work experience is tough, so I understand the impulse to create this section. Under those subheadings, create bullet points reflecting tasks that prove your communication and teamwork abilities, and also your skills. Remove the part about struggling with a team programming task. At least rework it to sound more positive. Try to frame it in terms of working together to solve complex problems, rather than being given a helping hand. Right now, your skills section is filled with “soft” skills like teamwork, communication ability, keenness to learn, etc. Although you listed your skills at the top of your resume in your Professional Profile, I would re-list them. If your resume is read by an Applicant Tracking System (resume reading software), having more relevant skills keywords on your resume will give you a higher chance of getting through the robotic guardian. This section is not necessary and considered unprofessional to include. PS. A two page resume is acceptable — increase the font size to 12. Do you agree with my tips? Leave a comment! And please, join the #RedditResume Critique Project.